Pictured is the 1957 paperback edition published by WDL. Also known as ‘The World’s Best Spy Stories’ in the US. In the past I have looked at Eric Ambler’s To Catch a Spy and Alan Williams’ The Headline Book of Spy Fiction. Both of them are anthologies of spy stories. Likewise is Kurt Singer’s The World’s Greatest Spy Stories (as the title would no doubt suggest). But Singer’s book is quite different from the other anthologies for two main reasons. The first is that is was initially published in 1954, and although Ian Fleming’s Casino Royale was originally published in 1953 in the UK, it wasn’t released in paperback in the US (under the title ‘You Asked For It’) until 1955. Put simply, this book predates the great spy-boom of the sixties and is in no way influenced by James Bond. Likewise it predates Len Deighton and John LeCarré. While in Sweden, I published several books on topics related to the Nazi regime – on the Nazi policy of forced sterilization, on Hitler’s Olympics, and the coming air war. I wrote the first biography of Carl von Ossietzky, a Liberal editor of a Democratic magazine called ‘Die Weltbuhne’ which was strongly anti-Nazi. This book was instrumental in getting Ossietzky, a concentration camp prisoner, the Nobel Peace Prize which was awarded in 1936. In 1940, I wrote a biography of Hermann Göring – the Nazi Air Force chief who ordered the aerial bombardment of England. Göring asked that the book be banned and confiscated, and that I should be extradited to Germany. To avoid extradition, I was able to arrange a visa to the U.S. as a correspondent for a Swedish newspaper. We left from Petsamo, a town in north Finland, on the ship named Matilde Thoren; Hilde and I and our six month old baby arrived safely to Ellis Island in New York. Marian were also held by the United States Immigration Department in a different wing of this old building. It was America’s Independence Day – the 4th of July. France had fallen while we were in mid-ocean. Hitler eas ready for the invasion of England. The United States was officially neutral. The detention did not disturb me. I knew I was safe. I had escaped both the Nazis and Communists in Finland. I knew the Lord would protect me and my family. America would not send me back. But I could not talk. To avoid legal complications it was advisable not to disclose that i had close contacts with the British Secret Service, with the Norwegian Secret Service and the police chiefs of several countries. America was neutral. I was not. I hated Hitler. I hated Stalin. I could not be neutral. Little did I know then what was ahead of me in the field of espionage and counter-intelligence. I never dreamed at the time that the United States Atomic Energy Commission would utilize my reports on atomic espionage and that I would write half a dozen books on spies and traitors. At the risk of trivialising, what is no doubt a truly remarkable life (and if it comes off as trivialisation – I apologise), Singer’s life could serve as the template for Victor Laszlo in the film Casablanca – as portrayed by Paul Heinreid. I can find no reference to this, and who actually wrote the script to Casablanca is a contentious issue, but I just wonder if one of the Hollywood scribes who worked on Casablanca had heard Singer’s tale? Ah, that’s just the way my mind works…jumping off at tangents. Anyway… back to the book under discussion. Apart from the writers from the sixties, most of spy-lit’s usual suspects are represented in The World’s Greatest Spy Stories. There is Sommerset Maugham’s Ashendon and Joseph Conrad’s The Secret Agent. This book also includes Belgrade 1926 from Eric Ambler’s Mask of Dimitrios. Ambler also took that chapter for his contribution to To Catch a Spy, but Ambler ‘tweaked’ his story slightly in his anthology, so it read more like a short story rather than an extract from a larger novel. One of the more interesting stories is Hilda Jung’s The Execution (as told to Kurt Singer). Initially it seems like a parallel to Singer’s own story, because Hilda Jung also ran a secret printing press in her basement with her husband, Paul. But despite the initial similarities, the story actually concerns the fate of two aristocratic German women who Hilda Jung ended up being imprisoned with. The women in question were Benita von Berg and Charlotte von Natzmer who were manipulated by a Polish spymaster named Serge Sosnowski. It’s a sad tale and shows what a dirty business, espionage is. Apparently this book was re-issued as The Secret Agent’s Badge of Courage (after the story by Ernest Hemmingway) and an additional chapter, called Francis G. Powers: Modern Space Spy was added. The World’s Greatest Spy Stories is a very entertaining read, with easy to digest bite size portions. Dotted with personal non-fiction tales, the book has a certain weight and poignancy that many other compilations of spy stories fail to capture. 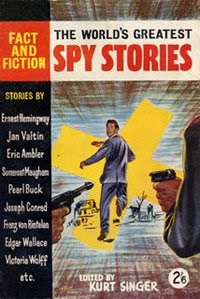 I'm a big fan of Singer's "Spy Omnibus," which is all factual stories, and was first published in 1959 (I think). I've wound up using it quite a bit on the ever-in-the-works Mister 8 comic project.